Antica Farmacista's Crystal Luminoso Decanter is the epitome of sparkle and refinement. With its fragrance reminiscent of a delicate sea breeze, Acqua is blend of sweet musk and the cool blue notes of marine algae. A favorite of those who prefer a light fresh unisex scent. The Crystal Luminoso Decanter is, in itself, a piece of art. 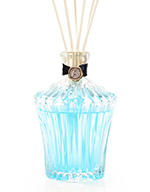 Handcrafted and hand blown European crystal is an exclusive Antica Farmacista design. The wax seal medallion exquisitely adorns the decanter neck and complements the superior craftsmanship of this magnificent crystal statement piece. Whether filled with your favorite Antica home ambiance fragrance or your favorite spirits, its beautifully sculpted silhouette is worthy of display in any distinguished home space. 500ml Crystal Decanter: 8" in height, adorned with a silver plated wax seal medallion around the neck of the bottle. Packaged in a satin lined 2 piece box, includes 500ml fragrance and a set of white birch reeds. Includes a satin ribbon for gift wrapping purposes.